The Randox Health Grand National weights are set to rise after the Nigel Twiston-Davies-trained Bristol De Mai revoked his entry in the race, leaving the Tony Martin-trained Anibale Fly out in front with the task of sheltering top weight. The classy grey - who finished third in the Cheltenham Gold Cup two weeks ago, has been reassigned to run in the Betway Bowl over three miles and a furlong on the Thursday of the Aintree festival instead. The National weights will all rise by 4lb as a result, with the nine-year-old Anibale Fly - who finished fourth in the race last year, set to carry 11st 10lb. Gordon Elliott trains three of the next four, with Alpha Des Obeaux up to 11st 8lb and 2018 Cheltenham Festival Plate winner The Storyteller one pound worse off on 11st 7lb. Owners Simon Munir and Isaac Souede are still represented in the race with the Nicky Henderson-trained Valtor on 11st 2lb, who is a pound ahead of the current favourite of the race - Tiger Roll, who won this last year under Davy Russell off 10st13 and holds obvious claims to become the first horse since Red Rum in 1974 to win it back-to-back. (Credit: Racing Post) Frank Berry, Racing Manager for owner JP McManus, said on Wednesday: "The plan is for Anibale Fly to run in the Grand National. "He came out of the Cheltenham Gold Cup very well indeed and Tony [Martin] is very happy with him." According to Berry, the McManus colours will also be carried in the National by former Gold Cup placee Minella Rocco and Regal Encore. Meanwhile, Anthony Bromley - Racing Manager to Bristol De Mai's owners [Souede and Munir], announced the news regarding the Dual Betfair Chase winner. 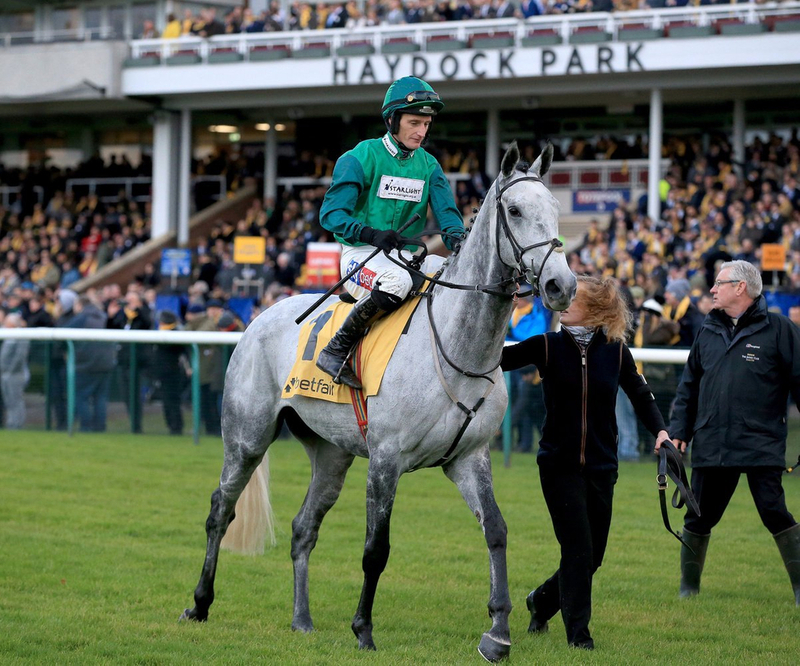 (Credit: Racing Post) He said "The owners, in conjunction with Nigel Twiston-Davies and Daryl Jacob, have decided Bristol De Mai will run in the Betway Bowl at Aintree on Thursday – and will not be confirmed at the forfeit stage on Monday. "He's already beaten the horses he will face in the Bowl, it is likely to be a small field and the prize-money is excellent", he said. Bristol De Mai's exclusion has resulted in the Tom George-trained Singlefarmpayment sneaking in at the foot of the weights. With forty runners guaranteed, Vieux Lion Rouge will only be allowed to run for David Pipe if another horse drops out between now and next Saturday. Valseur Lido, Abolitionist and the Trevor Hemmings-owned Vintage Clouds are all likewise sitting patiently on the substitutes bench.